UPDATE: The Tennessee couple who own the dog photographed in a cage on a searing summer day held a press conference Wednesday afternoon. At the conference, Tim and Valerie White claimed their dog, Sparkles was well-loved and healthy. "This was blown out of proportion," Tim White told reporters. "They painted this picture to make it look like we keep our dog out there 24/7 with no water, no food, when that's not so." Sparkles, he added, is only left in the cage for about three hours each day. Sometimes, it takes a community to tell a neighbor they're raising their dog horribly wrong. And sometimes, that neighbor tells the community to get the hell off her property. But the people living in a Cleveland, Tennessee, neighborhood refuse to give up on this dog. Tired of seeing a pit bull mix left caged outside in direct sunlight day after day, a neighbor took a telling picture of the suffering dog. It shows the animal wilting in a tiny cage with a rag on top of it, serving as his only shelter from the blaring sun. 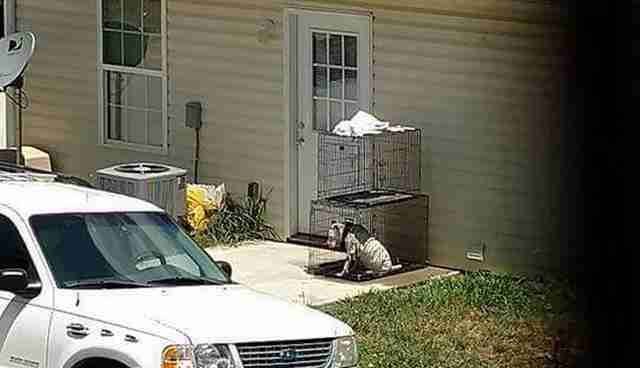 "You could not see any food, water, there was no cover on top of of the kennel to give it any kind of protection from the sun and with the picture I saw it shows it was 95 degrees outside," neighbor Claudia Anderson told WRCB. Carla Patton Welch, founder of Fighting for the Bullys Pit Bull Rescue, heard about the dog's plight and decided to pay the owner a visit. A video taken by an WRCB news crew shows Welch getting a door slammed in her face. That owner, who has not been identified, would later tell News Channel 9, "She's not beaten. She's not starved. None of that. So, I can't leave her in the cage outside when I leave?" "No, you're not gonna take my ... dog," she added. "I paid $500 for my dog." In a Facebook post, Welch said she begged the owner to let her have the dog to no avail. She says she also met with the Bradley County Sheriff's Department, who told her officers found "adequate" food and shelter during their visit to the property. The department has not responded to The Dodo's request for comment. If you would like to voice your concerns about this dog's condition, you can leave a message at 423-728-7300. Whether it's inside a car, or a cage, dogs should never be left in the hot sun.